It would be fair to say that Disney as a company and brand have experienced some of their most successful years since the height of the studio’s second golden age in the 1990s. You may have heard of a small passion project that they released in 2013 called Frozen, just a humble musical tale that achieved the meagre status of becoming the highest grossing animated feature of all time with over one billion dollars at the box office and still in regular theatre rotation at some cinemas across the world. This staggering success posed a big question to the powers that be as Disney, how on earth are you supposed to follow that? Rather wisely, the studio’s choice for a follow up bares absolutely no resemblance to the Broadway-esque, princess centric fairytales that are and probably always will be Disney’s bread and butter. Instead we have Big Hero 6, a Marvel comic adapted futuristic adventure filled with cool technology and a twist on the usual super hero narrative. In the alternative fusion city of ‘San Fransokyo’, the world seems to be a hybrid of Western geography and accents with the Asian tone of futuristic techology development, and living in the centre of this world is Hiro Hamada (Ryan Potter), a fourteen year old techno whizkid who spends his time attending and winning illegal remote controlled robot fights. When his role model and big brother Tadashi (Daniel Henney) tragically loses his life, Hiro loses his enthusiasm for life and retreats within himself. That is, until he strikes an unusual friendship with Baymax (Scott Adsit), Tadashi’s completed university project, an inflatable robot invented to serve as a personalised healthcare companion. With the help of the loyal Baymax and an eccentric gang of Tadashi’s college friends, the plot evolves in to a game of cat and mouse in which Hiro and his companions use all of their technological genius to locate and catch the man who they believe his responsible for Tadashi’s death, with all the expected twist and turns along the way. 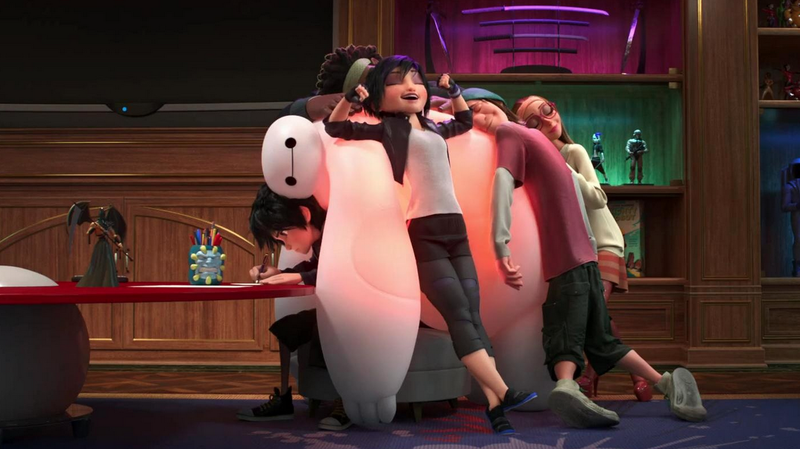 In many ways Big Hero 6 feels more like a Pixar creation than a solo Walt Disney Studios project. The film possesses all of the recognisable themes and traits that we have come to expect including humour that caters to all ages and a willingness to explore darker themes like loss and even murder, but unlike the very best of examples like Wall-E or Up, much of Big Hero 6’s star quality and appeal is the result of one single excellent aspect that elevates the rest of the picture on its own. This single aspect is the character of Baymax, a weird, whimsical and wonderful creation that ranks up with any of the best animated characters of the recent past. 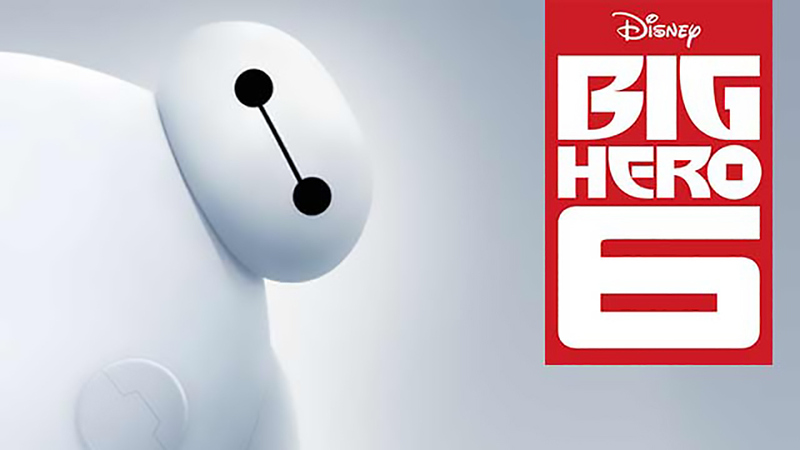 The film truly comes to life whenever Baymax is on the screen and loses some of its charisma without him. The longer lists of characters including Hiro and the central college friends are all solid and have their moments of fun, but almost in the same vein of Genie in Aladdin, this really is a film all about an adorable, lovable captivating supporting character. Away from the sheer joy that Baymax brings, the film as a whole, whilst being undeniably enjoyable, lacks some of the innovative punch that we have come to expect from quality animated films these days. The plot is quite clearly signposted and much of the narrative is standard predictable fair, and the film at times is really let down by cliched and hackneyed lines of dialogue that can only be put down to lazy screenwriting. In terms of the cast, all of the film’s voice artists give solid performances, though the nature of the picture means that there is very little to comment on with regards to this aspect. As opposed to some other animated features that feel inherently improvised and elevated by their actors, the lines spoken are clearly as instructed, and the enjoyment of the film comes through the pleasure of the animation and tightly constructed package rather than in any specific off script humour from the voice cast. Overall, Big Hero 6 is an above average animated feature that is elevated to good because of an adorable, innovative and memorable central supporting character. Baymax is a marketer’s dream and I would not be surprised to see his figure alongside the rows and rows of Frozen dolls in toy shops this year. Much like Stich in Lilo & Stitch, all of the film’s best moments are either caused by or made memorable by his presence, one of the cutest and most original characters in recent Disney history. An enjoyable ride and probably a film that I will return to when craving some fun animation. A successful experiment in unique world building that really gives the film some unique character, and though perhaps not the very best that Disney has to offer, still a country mile ahead of many releases from numerous other studios. Great review yo. While the film is a little conventional and predictable, I appreciated that the film was self-aware and delivered the goods when it came to the character moments and having a few unique surprises when it came to the mystery behind the villain. Plus the film looked incredible with a great art and animation and the soundtrack was beautiful. I would argue this is my favourite Disney film in recent times, but I think I maybe a little biased because of the comic book and superhero elements incorporated into this film. Great review 🙂 I really enjoyed Big Hero 6, but it was just a little too predictable. Baymax however, absolutely made it for me and I loved every scene he was in!